This work had been inspired by reading her cousin G.P. Cather’s wartime letters home to his mother. He was the first officer from Nebraska killed in World War I. Claude Wheeler, the subject of the novel, is a young man growing up on a Nebraska farm. The son of well to do parents, Claude is troubled by his apparent inability to find purpose with his life. Everything he does seems to turn out wrong, at least in his own mind. Although he is a skilled farmer, Claude believes his destiny lies elsewhere. While attending a church-affiliated college his parents have selected for him, he befriends a German family (the Ehrlichs’) who open his eyes to other possibilities in life. . . .Claude to read aloud to her. Bayliss had never been bookish. Even before he could read, when his mother told him stories, he at once began to prove to her how they could not possibly be true. Later he found arithmetic and geography more interesting than "Robinson Crusoe." If he sat down with a book, he wanted to feel that he was learning something. His mother and Claude were always talking over his head about the people in books and stories. Who's the GREAT American writer ? Not Hemingway, Fitzgerald, Wharton, Faulkner. 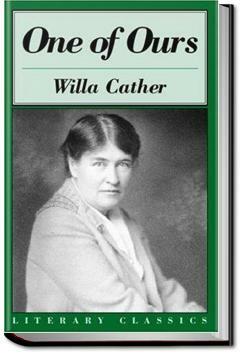 Here she is : Willa Cather. I'm crying as I write this review??? And it was a book for class???? I didn't enjoy this book as much as My Ántonia and O Pioneers!. Willa Cather's writing about farm life, etc. is beautifully done but this story was very slow and somewhat boring to me. I'll definitely read more by her but for me, this book wasn't her best.